Another day, another 12+ hours spent walking. That's basically what this adventure (if you can call it that) boiled down to between this Bulbasaur and I. We would wake up in the morning, do our normal morning routine, then start walking until we found the next city, then crash at the Pokemon Center, wake up, and repeat. We didn't have a purpose, we were just bored out of our skulls with nothing else to do. But today was a little more interesting. Today started off weird. I woke up really early, around 4:00 AM. I went to the bathroom, then decided that waiting another 4-ish hours for Bulbasaur to wake up wasn't worth it, and I fell back asleep. I woke up for real at about 8:00. Bulbasaur had decided it was a good idea to sleep in, a lot. Not something i'd mind doing, but since we were likely to be caught by some random trainer, I didn't do that very often. I usually assume he hears me getting ready, wakes up (which he does) and meets me outside when he's ready to go. I sat outside for a good 15-20 minutes, and I probably would still be waiting if I didn't go back inside to check on him. Still asleep. I tried to wake him up nicely, but slowly lost my patience to the point where I had to physically drag him out of bed to get him up. We went straight out the front door, since we were already running late, and started walking. Everything was going fine. We actually saw some cool things, like some trainers fall into a giant pit they just finished digging, or a Pidgey picking a fight with a Pikachu. Y'know, silly stuff. 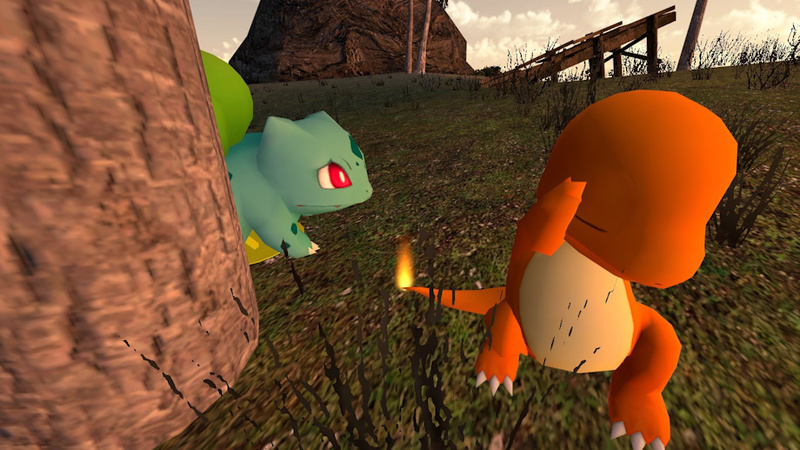 Around about 1:00 PM, Bulbasaur started acting weird. He seemed distracted, all the time. I just shook it off as him not having breakfast, or maybe he needed a drink. I searched for some source of fresh water for him, and found a small river that fixed him up. At about 4:00 or 4:30 PM it was back and noticeably worse than the first time. He was leaning more towards paranoid rather than distracted, constantly looking around like someone was following him, or that he was lost and didn't know where to go. Of course, I asked him what was wrong, and he didn't want to tell me. You could see something was wrong with him, but he wouldn't reveal it. So, we kept walking. About an hour or so later I thought he had gone crazy. It was like he was seeing ghosts and hearing voices. He didn't want to move, he just wanted to stand there. I asked him what was wrong and he told me that I woke him up and rushed him out of the Pokemon Center so fast that he forgot to go to the bathroom before we left. I asked the logical follow-up of why he's just telling me this now, his response was that he was always really shy about these types of things. I told him that there were no bathrooms around here, and he'd just need to go off the path a bit and go. He looked at me, confused. Then I realized he's probably only gone to the bathroom... well... in a bathroom. I didn't know how to explain the process to a quadruped, so I just told him to follow me. We didn't go too far off the path, but far enough that anyone walking on it wouldn't see or hear us. I had actually forgotten to go that morning too, so since -[THE WRITER HAS A WATERSPORTS FETISH]- I had no other way of explaining to him how to go on a tree, I decided to give him a more physical explanation. I was about to go like I normally would, but then I remember the whole quadruped thing and stopped myself. I had no idea how a quadruped went to the bathroom on a toilet, let alone on a tree. I stood there for a minute, looking like my brain locked up. I started to pace, trying to figure this out. Only when I got down on all fours did I know what to do. I called Bulbasaur's attention, he looked over at me surprised to say the least. I told him to watch, because he would need to do this in a few minutes, and also should this situation happen again. I positioned myself somewhat behind a tree so that Bulbasaur could see, raised my leg, and put the demonstration into action. I gave a quiet sigh of relief, which was thankfully silenced by my, *ahem*, demonstration. If I had only been holding it since about 4:00 that morning, I didn't even want to imagine what Bulbasaur was feeling from holding it in since yesterday at about 8:00 AM. I tried to make sure he was watching while not making it obvious, since I really didn't want to have to help him go. Thankfully, he watched the entire thing, and when I was done came over to the tree and gave it a try. Except, it wasn't that easy. He walked over, stood on the wet spot that signified the spot I stood in, then asked me if I could make any noise. I didn't want to run around screaming, so I did what everyone who says yes to that question does and just started whistling. I looked at him, and he was really shy. His cheeks were red, his head was low, one of his legs covering his face. I turned around while also covering my face, trying to give him as much privacy as I could. I said he had as much privacy as he could get, and he might as well just go. This is where things get awkward. I had to sit there, whistle, not turn my head, not react to the sound of him relieving himself, and basically try and make standing in front of a shy Pokemon that's really embarrassed and going to the bathroom right behind you not awkward or judgmental, or else you'll be sent back to square one. Now imagine having to do all of that, for over a minute. For such a small Pokemon, I was surprised at how long Bulbasaur was going. Probably the most awkward part of it all was when I stopped whistling to catch my breath, he would stop going, and then resume about a second after the whistling returned. After about a minute of this, he had finished, which he stated rather boldly by running over to me and saying he "did it", kinda like when a baby uses the toilet for the first time. For a shy person, he was really excited about this one thing, and I can't figure out why. He even brought me over to the tree to show me how big his puddle was. He had actually gone for so long that the ground stopped absorbing it, and there was a big yellow puddle sitting there. You could tell he didn't do what I told him to, since there was nothing on the tree, but I was happy it was over and we could move on. We started walking back towards the path we left, checked both ways before hopping back onto the path and continued walking. Bulbasaur seemed really cheery now, and to be honest I still don't know why. He's really shy, since a similar thing happened a few days later, this time without the bragging afterwards, so i'm not entirely sure on why he was so happy then. So, not bad for a first story, huh? So what program was used to make this? Garry's Mod, costs about $10 on Steam. There's a similar program called Source Filmmaker, which is free but harder to get to grips with. Definitely not bad for a first story! You've certainly gotten better since this one. Though, I wonder if it would have been more "private," for Charmander to walk some distance away? I keep getting the vibe that Char is like Bulbasaur's caretaker or something of that nature, so I'm curious about what their relationship is really like.